Vacation rental house. Sleeps 4, 2 bedrooms, 3 bathrooms. No pets allowed. The property does not accept pets and does not allow smoking. This home has a maximum occupancy of four adults. We may be able to approve additional small children if guests bring their own sleeping arrangements. Using the couches as sleeping accommodations is not allowed. Please inquire if you are interested in reserving the home with children. 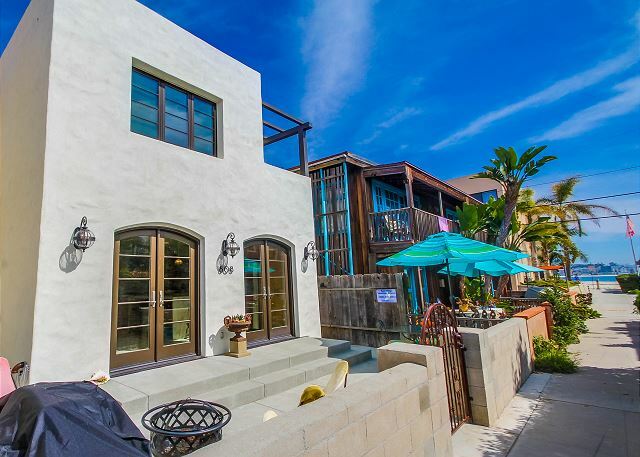 Located just steps to the bay and a short walk to the ocean this home is perfect for a relaxing San Diego Vacation Rental. There are many shops and restaurants within walking distance and the grocery store is just a half mile North. 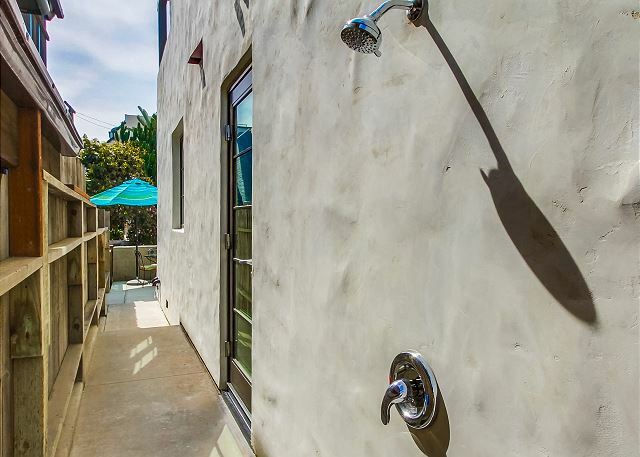 The home is newly remodeled with quality finishes and amenities. 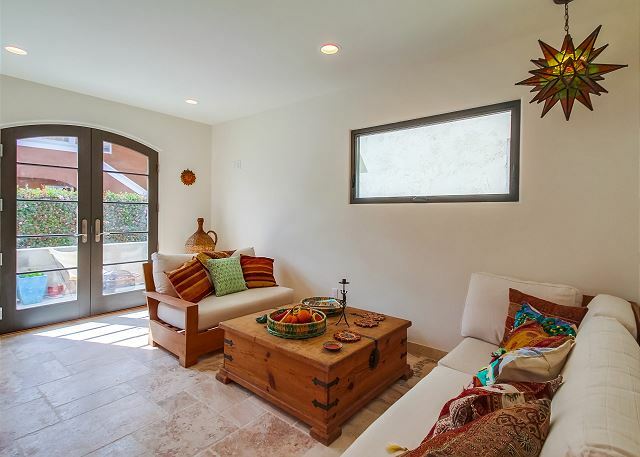 The main living area on the ground floor is a bright and welcoming space to gather. 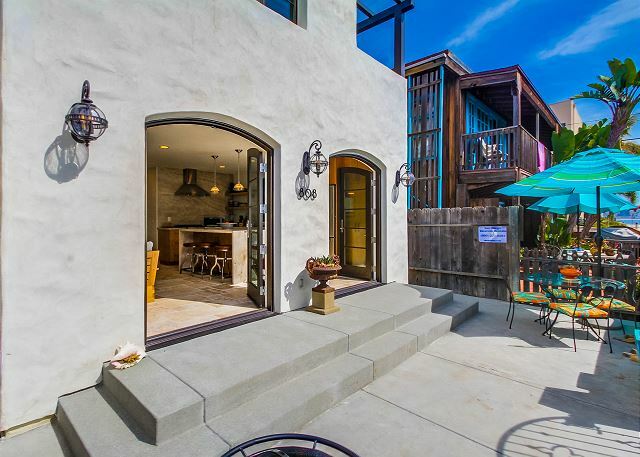 Enjoy classic San Diego indoor/outdoor living by opening both French doors to the private patio complete with propane BBQ and dining table with umbrella. 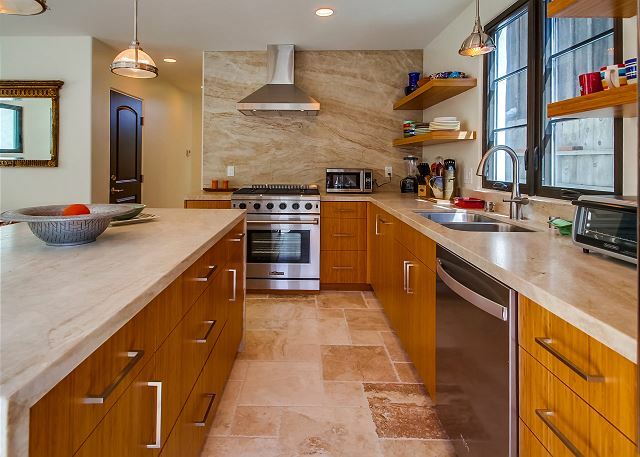 The kitchen is fully equipped with high end appliances, dinnerware, cookware, and utensils. 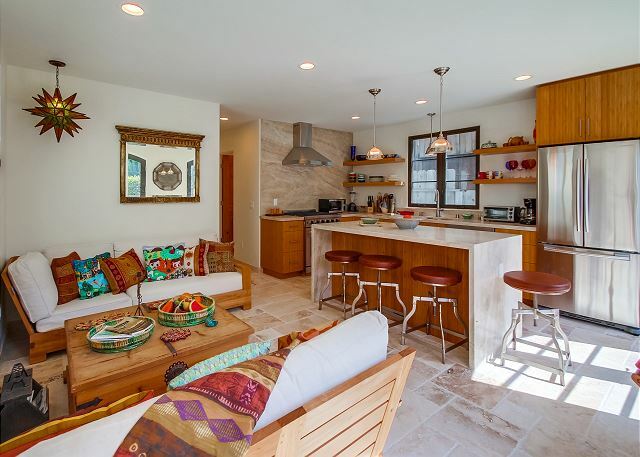 The large marble island has plenty of room and seats for four. The seating area has a couch, love seat, large coffee table, and wall mounted flat screen TV. Also on the ground floor is a full bathroom with shower. Both bedrooms are located on the second floor. 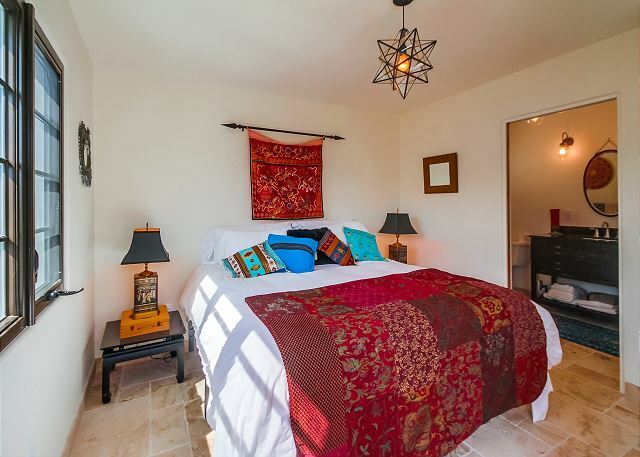 The master suite is cool and relaxing with a King bed, large windows and French doors to the private balcony. 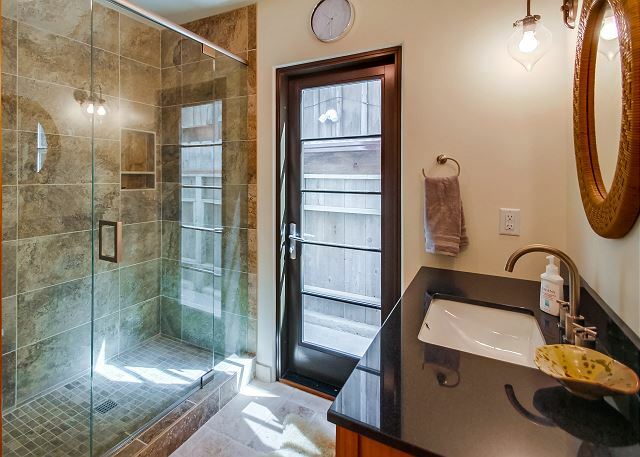 The master bath has a beautiful tiled, extra large shower with seat. 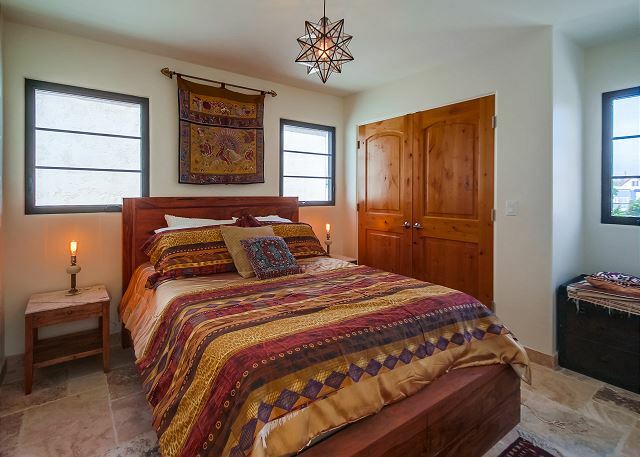 The guest bedroom is warm and inviting with a Queen bed and private bathroom with tub and shower combo. Both bedrooms have air conditioning units so the temperature of each room can be individually controlled. Parking can be difficult in the Mission Beach area year round. 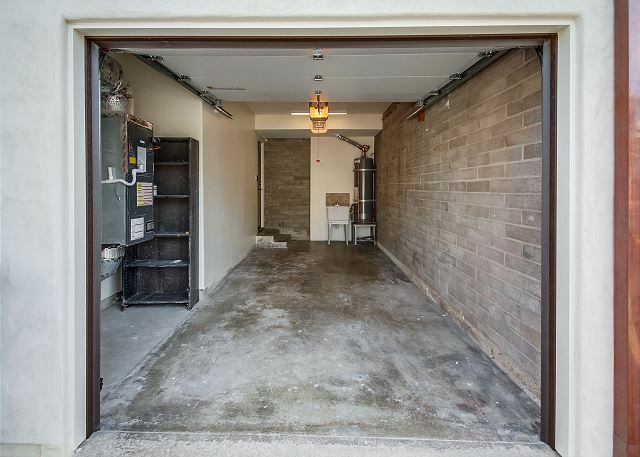 This home does include a one car garage, the dimensions are: 6' 10" H x 8' 4" W x 17' 3" D. Please make sure your vehicle/s will fit within these dimensions. Thank you for such a great review. We hope you look us up the next time you visit San Diego. Location, location, location...Perfect spot to enjoy both the beach and the bay. The home is magnificent. The bathrooms were stunning and so was the kitchen(chef's dream). The bedrooms were spacious and the entire home was perfectly decorated. I must stay for SD. Great location, clean well designed home. It had everything we needed. Only thing is we wished the water pressure in the shower was better, it was so slow it was hard to rinse soap off. Great stay at this property. Very comfortable and had everything we needed to be comfortable! We had a fantastic stay near the beach, great location, Loved it! Got away from the Heat! Wow! This place was clean, modern and newly remodeled. Too many good things to mention. Downside...small living room. Big coffee table limits the access between couches, and stools by the center island. 2 adults and 2 teenagers was perfect fit. That was the only thing we could complain about...which was nothing. We would go back there ASAP if we could. . Easy access betweeen Mission bay and beach. Coffee and shops were close. You will become a pro by the end of your stay.. backing your car into the tiny Garage. Very Nice Place! We loved this house!!! It is perfectly decorated, furnished, clean, safe, and easy to use!!! 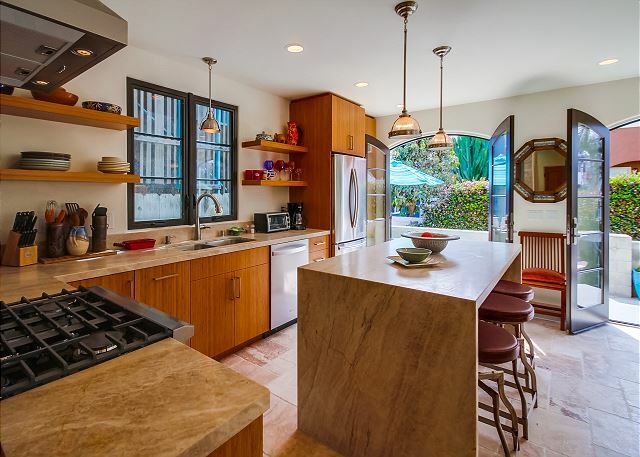 The open kitchen/living area that opens up to the patio makes this home feel extra large, too. The bedrooms are perfectly appointed, beds are comfortable, bathrooms modern and spacious and clean. The house is in a perfect location and not noisy at all. AC works great, too. Parking was especially handy - we had a VW Jetta that fit in the garage but I wouldn't recommend anything bigger. I would definitely rent this house again and again! Had most things we could have needed, the little extras such as beach cruisers or paddle boards would have been fantastic, particularly as lots of others in the price range has them. Garage fitted a good size SUV which was a bonus. Easy access via lockbox and code which was good as our flight delayed. More towels and bathroom amenities (eg soap in the master) would have been appreciated. Overall excellent, would definitely stay again.